HTC Magic to offer Microsoft Exchange support? One of the biggest detractors from the T-Mobile G1 was its missing support for Microsoft Exchange. Clearly many people in the corporate world eying the Android device had to look elsewhere. 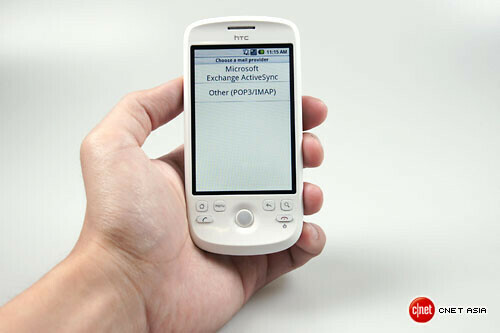 Recently CNET Asia managed to get their hands on an HTC Magic and saw Microsoft Exchange as an option. So a photo displaying the interface can clearly show the new offering. Users would not rely on third party applications to get their contacts, e-mails, and calendar synchronized. Then a Google representative informed CNET Asia that Android does not currently offer the support. Finally, an HTC representative cleared things up by saying that the Magic being sold in Asia is not a “Google experience.” It does not have the “with Google” logo on the back like the one found on the G1. So HTC was able to add specific software into Android like Microsoft Exchange, a custom dialer application, and additional widgets.